Prayer is love. Prayer is the breath of the soul. Today, false evangelists obscure the Word of the Gospel with their human words and, with false interpretations; they tend to play down the importance of prayer. Moreover, they say, why pray if God knows everything and knows everything! With this premise, many, despite considering themselves good Christians, have abandoned this beautiful practice, sometimes replacing it with a little thought fleetingly addressed to God or, at most, the recitation of the Our Father and nothing more. False prophets, ensure, all right: "How do you lose time in prayer when you can work for your job, your family, just fun." God, they say, can wait. So we find ourselves to live without the help of prayer and numb conscience: it is true that remains the Sunday meeting with the Lord, but not enough because without prayer are lacking determination and vigilance. Consequently we accepted compromises with his conscience and the consequent shutdown of the virtuous path. It is a gradual change that escapes to the conscience and allows to always considering ourselves good Christians, but it is a very dangerous situation where you cannot linger long otherwise the rapids of life will lead us where we do not want. Prayer is, therefore, a very important element for the soul, is comparable to the flame that feeds the fire. So, how there can be a fire without a flame that feeds it, also there can be no love in God without prayer. If the word is important for human love, even more is the prayer that conveys the love and unites us to God. In it there is his breath of love, there is a way to share with God all you want. There is no other way to communicate with him. As in human love with continue to externalize our feelings to your loved one even though she already knows them, because love requires sharing and union, so we have to do with God. After all, it is natural to resort to a loved one in need. Prayer is therefore a powerful weapon to use against the weaknesses and the worries of life and is necessary to obtain from God, talking to Him, the salvation of the soul and the necessary means to achieve the virtues. That's why those who pray and those who do not pray get lost. The proud man who trusts only in his strength, not knowing the power of prayer, fails to ask and falls; while the humble, though felt by so many temptations, resist. Yes, prayer is a sigh of love, is a means of support and salvation, is an expression of gratitude and praise for a God so good. 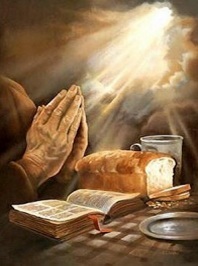 The Psalm says: "I love the Lord for he has heard my voice and my prayers.". Prayer can do anything because it draws on the power of Jesus, the only condition is that the faith and the involvement of the heart. Christ invites us to pray to God tirelessly and assiduously. He wants to transform ourselves through prayer, to launch out beyond the human nature and make the change to spiritual growth. If it is true that life depends on the strength of our thinking, by force of will and impulse of the heart, it is important to know that, through the prayer of union, you can find the sap that strengthens the mind, the will and the reasons of the heart. Can eliminate every doubt, every worry, every fear, and every selfishness through the fire of divine love. Prayer is conversation with God, since by the words, involves the heart in the heat of love. This is the essence that we must look in the silence of the mind, because through the quiet you can let the feelings flow from the heart, the emotions that God has put. Conversely, for the brave, for those who know how to love, prayer is like the sun, with rays, dissipates the mist, eyes free to splurge on new horizons that God has created for their delight. Then, over time, prayer becomes like a river in flood and overwhelms the levees with strength of our egoism, of our pettiness. Directs our thoughts to praise, to thank God for the countless benefits. We all need to heal from the spiritual laziness, selfishness, pride, from sin, from the weaknesses. We must beg the beloved Jesus to let him turn to our aid, because only He can heal us and transform us in the new man spoken of in the Gospel. The cry of the heart must not remain a desperate cry launched into space, but through prayer, must become the engine of life, should produce a powerful spiritual drive. It has to feed the flame that burns in the hearts and move us on the path of true love. Jesus invited us to always pray for our salvation, to give us that joy that, going through his union, is the bridge between heaven and earth. The influence of evil, injustice, servitude to the god of money, now reigns in the world. Prayer can fight evil and create a new life expectancy. Between you and me, says God, there is a bond that nothing could break. I am your God; you are my son. We will share, I My eternity, my life and My holiness, you your daily life, your earthly life and your poverty. Your existence will join Mine, and we will never be separated, for I am God, and I will not set my covenant in question. In a way, our destinies are bound to each other. Prayer is the privileged moment in which we contemplate the love of the Father who generates us to the filial life. He wants to free us from the depths of our humanity to develop freely in us. Then we will no longer seek the ideas and words to express our prayer. We just exist as children of God; our very being will be a prayer.